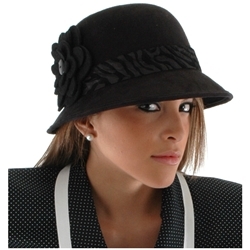 This authentic 1920s style hat is a classic shape for females, and is sure to flatter almost every face. It is made of superfine, ultra suede and features a burnout velvet band, complete with a punched felt flower detail and button adornment. Hat has elastic inner band for adjustability. Great for 1920’s period woman costume of flappers.